British Airways says it is "working round the clock" to reunite passengers with their bags but it will take "some days" to clear the backlog. Many people have contacted BA on social media to complain they still do not have their luggage back. The airline is now operating a full flight schedule and its IT systems are up and running after a systems failure. Thousands of flights were cancelled over the bank holiday weekend, with 75,000 people affected. BA delays - what are my rights? Can Cruz keep control of BA? What went wrong at BA? In a statement on Tuesday, the airline apologised again for passengers' "frustration" and said it was "working round the clock" to get luggage back to customers as quickly as possible. "Unfortunately it will take some days to get every bag back to every customer," the airline said. 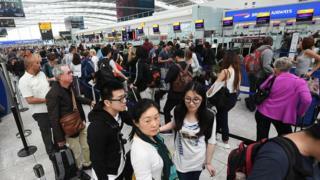 The airline also admitted that it was aware some passengers were unable to file a delayed bag report on its website. Thousands of BA passengers worldwide are still without their bags and have been bombarding the airline's lost luggage phone lines, website and social media feeds. Prime Minister Theresa May has also called on the airline to compensate passengers left stranded over the bank holiday weekend. "It is up to them to sort their IT out," she told an election campaign event. Pippa Howe-Velazquez from Andover was travelling with her elderly mother, 69, on Saturday from Heathrow to Majorca, but their trip was cancelled. Three days later she is still without her bags which contain medication for her mother, who has diabetes and cancer. "She was advised not to take her drugs and insulin through in hand luggage due to the heightened security level, so we packed them in the hold," Pippa told the BBC. On Tuesday, after repeated phone calls, they were told their bags were "not a priority" as they were still in the UK. "My mother is worried sick and I am shortly taking her to hospital as she is suffering very badly with her diabetes." British Airways has also been criticised on social media for directing some passengers towards a premium-rate phone line that costs up to 55p a minute from a mobile device. In response, the airline says customers can add any phone charges into claims they submit and it will look at them. It also says there are free or local rate alternative phone numbers for passengers who want to contact them. 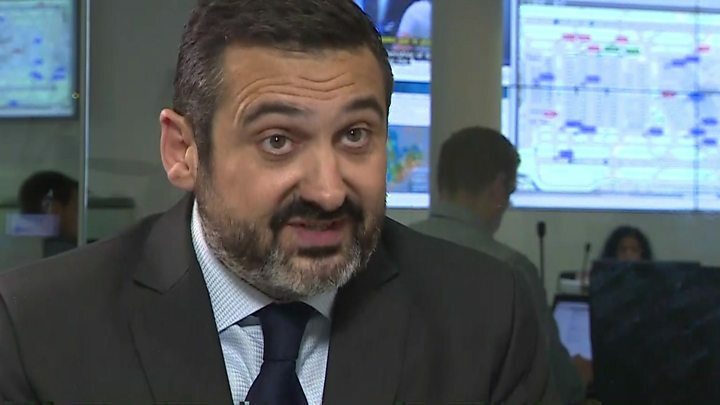 In his first interview since the systems failure, BA's chief executive Alex Cruz said: "There was a power surge and there was a back-up system, which did not work at that particular point in time." Despite the knock on effect of the incident lasting three days, Mr Cruz said the hardware problem was restored "after a few hours", and promised the company would "make sure that it doesn't happen again". He told the BBC this had affected "all the operating of our systems - baggage, operations, power processing". The GMB union has blamed the problem on technical staff being outsourced from the UK to India. But Mr Cruz said there had been no redundancies or outsourcing in this area, adding that there had been "locally hired" staff attending to the maintenance and running of the infrastructure. The focus is now likely to shift towards the financial impact on the airline. BA is liable to reimburse thousands of passengers for refreshments and hotel expenses, and travel industry commentators said the cost to the company - part of Europe's largest airline group IAG - could run into tens of millions of pounds. Shares in IAG, which also owns Iberia and Aer Lingus, were down 1.3% in afternoon trading in London. The stock has risen by more than a third this year, valuing the company at £12.6bn. Similar computer problems happen with "alarming regularity" at all airlines, said Bert Craven, former chief architect of Easyjet's IT booking system. He now advises airlines around the world on their IT. Airline systems are "extremely complex," he told me, and it's just possible that recent redundancies at the airline left them short of people who really knew the system intimately - people who could possibly have fixed it more quickly. They're always built with a back-up, but over the years, Mr Craven said, the original architecture will have been updated and adjusted and it's possible that left a flaw without anyone realising. Plenty of people have asked me whether the airline ever practised coping with this kind of failure. BA told me that they do stress test their systems - but they wouldn't say how or when they last checked the one that collapsed so spectacularly across the weekend. Mr Craven said it's always difficult "because rehearsals cost time and money, and there is always the danger that they can damage the system for real". Neil Wilson at ETX Capital said IAG chief executive Willie Walsh had serious questions to answer about cost-cutting: "A master of slicing back the fat, the outage has investors worried that he's gone too far." George Salmon, a Hargreaves Lansdown analyst, said: "The whole sorry episode has undeniably put a dent in BA's reputation for delivering a premium service, and the worry for shareholders is that this unquantifiable impact could have longer-term consequences." Davy analyst Stephen Furlong said the cost to the carrier of cancelling one day of operations was about £30m. If your flight departed from within the European Union or was with a European airline, you might have rights under EU law to claim if the delay or cancellation was within the airline's control. If your flight's delayed for two or more hours the airline must offer food and drink, access to phone calls and emails, and accommodation if you're delayed overnight - including transfers between the airport and the hotel. BA delays - what are my rights to compensation?